March 2017 – Steampunk – Shrunk! Finally my furnace was burning away merrily and Inferna the Twisted Firestarter was safely ensconced in her cage (with a large DO NOT FEED sign in case anyone felt tempted to give in to her endless wheedling and eyelash fluttering). Huge clouds of steam billowed from the copper pipe my assistant and myself had fashioned from something called a ‘jumbo drinking straw’ and a supply of copper tape normally sold, apparently, to deter slugs from entering plant pots. The twenty-first century will forever remain a puzzle to me. “So what do we need now, Henry?” enquired my companion. I made a list of the items required for the machinery, valves, gauges and pipework and a rough sketch of the way I intended to fit them together. I must confess that much to my chagrin, I am reduced to relying on the kind lady’s charity, since my own – not inconsiderable – fortune remains locked in my own time. Even if I had managed to bring some with me on my time-travelling adventure, it would doubtless have suffered the same fate as myself and been reduced to one twelfth of its natural size, rendering it quite useless in my present surroundings. The dear lady is quite phlegmatic about the expenses, however. She insists that the total cost of building my engine room has been less than five pounds. That seems quite a large sum to me, but she insists it is a paltry amount in her age. I agreed that this would be an excellent solution and would prevent me from feeling aggrieved at causing her to be out of pocket. Beaming broadly, she returned from her shopping expedition and tipped a collection of items on to the table. I had to admit she had done well. There were narrow gauge steel tubes, various jewellery beads and fittings, a wooden memo box with a picture of two children and a rabbit peeling from it (excellent housing for the machinery, once the picture was removed and it had been painted and burnished), some metal devices for inflating footballs and a heavy-duty metal nut and bolt set. I began work at once. Within a few hours my engine was chugging merrily and the machinery was in perfect working order. So – if all goes to plan – this will be my final entry in my diary for the year of 2017. I have said fond farewells to my able and accommodating full-sized assistant. I have made all the necessary calibrations and am shortly to plug my heavily rebuilt portable time-machine into the engine to charge it. Hopefully, I will then depart for my own world and be restored to my full size, with many a tale to tell. Assistant’s note: I am pleased to report that Henry’s departure was successful – although I do rather miss him. 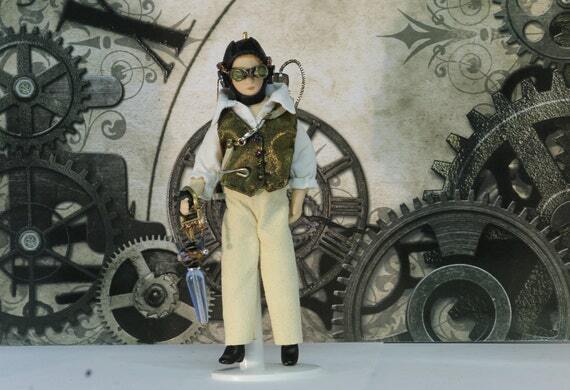 By some strange space-time anomaly, a lifeless but otherwise perfect version of Henry, as he looked when he first arrived in my cottage, has remained behind and is offered for sale at the Steampunk Dolls’ House (click for link). The engine room will also be offered for sale, either at the shop or on my Steampunk – Shrunk! stall at the Glastonbury Craft and Vintage Fairs held once a month. Contact me for details. I recall that last time I penned an episode of my adventures as a one-twelfth scale explorer, inadvertently lodged in the year 2017, my normal sized assistant and myself were pondering a method of combustion for the steam engine we were building, to allow me to power up my Machine and escape to my own dimension – in every sense of that word. By a piece of great good fortune, I myself was able to solve that particular conundrum. It occurred when I noticed, in a nearby city, an establishment named Whitherspoons. It had a most favourable external aspect and, hoping that I might have stumbled upon a high quality gin palace, I eagerly made my way towards it. No sooner had my foot alighted on the threshold, however, than I was pushed backwards by a person carrying a cage almost as large as himself and being propelled from the building with considerable force by a burly and irate landlord. The language which passed between them convinced me that this was in no way the kind of establishment I had anticipated, so I turned my attention instead to the evicted individual. I assisted him to his feet and righted the cage which, I then noticed, contained a greenish yellow reptilian creature with a baleful expression. The creature attempted to slink further down the cage and averted its gaze. “What manner of creature is it?” I enquired. “I understand your predicament,” I responded. That was when I had my enterprising idea. “I don’t suppose you’d be willing to allow me to take her off your hands, would you? I can promise her an excellent home and plenty of coal. At that moment, though, the door of the inn opened and two exceedingly merry gentlemen emerged, bringing with them a distinct odour of cheap ale. The temptation was too great for my companion to resist. And without further ado, he handed me the cage and returned to his beverage, while I headed back eagerly to my assistant’s cottage with my new acquisition. Henry’s Engine Room, including the twisted fire starter, will be on display at the Steampunk-Shrunk! stall at Glastonbury Town Hall on Saturday 25th March 2017. I’m not lost. It is, after all, impossible to be lost when you are in possession of a temporal transformer. Time and space have been my playground for some time. However I do find myself – ah – temporarily displaced, one could say, since my efforts to adapt the Machine to incorporate the space-time continuum (a theory I discovered on one of my journeys into the twentieth century) have had a somewhat unfortunate – and unforeseen – result. In short, I find myself marooned in the year 2017 and one twelfth of my normal size with a malfunctioning device. Nevertheless, I am by nature a resourceful gent and I have acquired the services of a slightly eccentric but mostly harmless lady (of normal dimensions) who has agreed to act as my guardian and enabler while I am forced into this regrettable situation. The good lady looked only mildly taken aback when I informed her that I would need an engine room – at 1/12 scale, naturally – in order to generate enough steam power to re-calibrate and start the Machine. She rummaged in a cupboard and produced a small valise of suitable dimensions (although quite UNsuitable design). Once I had persuaded her to redecorate it in a more suitable manner, though, I decided it would do very well. “So what goes inside it, Henry?” the enterprising lady asked. “About that size and shape,” I said. “Right you are,” she grinned, and decanted said capsules into a tin. We worked together to transform the container. She wielded the car spray can and fitted the pipework, while I worked on the more intricate gauges and levers necessary to maintain the correct pressure and temperature. I am beginning to feel quite optimistic about this project. I am livid, madam, absolutely livid! How dare you subject me – Lieutenant Bertie Brimthorne of the 2nd Company of the Ordnance Survey Battalion to this indignity? I have my reputation to consider! I am a gentleman, ma’am, but you are no lady. I presume, Bertie, this outburst has been triggered by your discovery that I printed a few, um, photographs of you on my Facebook page. ‘A few photographs’ you say? Will you attempt to deny that one of these images showed me completely unclothed, woman? Well, yes, certainly one does depict you au naturel, Bertie, dear, but it’s only there to show the followers the transformation that occurred as you took on your current resplendent form. I’m quite delighted with your present appearance, and so should you be. Followers? Who are these followers? You mean others are able to view this dreadful photographic image? Madam, you are quite shameless! In my fearless journeys through the darkest and most impenetrable parts of the planet and beyond, I have – on several occasions – encountered indigenous persons in a certain state of undress. However, I would never sink so low as to obtain visual images of such people, far less to broadcast them to all and sundry. I only wish you had seen fit to afford me similar courtesy. Well I apologise for any embarrassment my actions have caused you. I’m afraid the workings of my dimension must feel quite alien to you, Bertie. Social media has rather taken over here, in much the way that steam and clockwork have taken over where you are from. Well to my way of thinking, you’d be far better off with steam power and our ingenious mechanical devices. Fiddling endlessly with those strange little glass boxes of yours – it isn’t healthy! I trust that your photographs for this piece will be of a more appropriate nature. Of course they will, my dear Bertie. And unless any readers take it upon themselves to visit that Facebook page, they will be none the wiser. Hmmpf. And what are you doing now? Why have those three words there turned blue? What mischief are you up to, woman? Just fancied a change of colour, Bertie. Black can be so dull. Now why don’t you share some of your daring exploits with our readers? No time. I’m off to Mongolithania first thing tomorrow morning and I need to check my supplies. I’ll bid you good day, madam.